It all started about a year ago when I first got the idea to create a membership site. I knew there was a part of my audience that wasn’t READY for a $997 course, or even a $497 course. But, they wanted access to high-value, great information. If I actually launched it, we wouldn’t get enough people for it to really work. These might seem trivial, but they are important because I had to dispel each of these beliefs in order for this to be a totally successful launch. Because if I wasn’t convinced, I would never be able to convince anyone else this is worthwhile. And what’s more, I don’t back anything unless I think it is worthwhile for everyone involved. In order to come up with a membership concept that would work for my audience, I had to REALLY think through something. I know that sounds harsh, but I need to stay profitable. I wanted to add recurring revenue to my business, but I’m not able to add 30-40 hours of recurring work per week. At the time I launched this idea my goal was only to be working 5-7 hours a week. Note: That’s not how much I worked to build the business, or even my “normal” hours - but I was taking a little vacation during the holidays! I needed to make sure that my audience got tons of value from what I created, without requiring me to be there 24/7! I also needed to make sure that it wasn’t so “content heavy” that it would make me feel like a hamster on a wheel endlessly churning out new content. I actually read through comments on my Facebook page, on my podcast, and in my email and I found one underlying commonality. Usually these comments were centered around the topic of marketing, Facebook ads, or funnels. How can I create a breakdown of a marketing system each month, without it taking more than 5 hours? The answer? Strategy, Team, & Content. By investing time developing a solid, overarching strategy, delegating to a team, and curating killer content, anything is manageable. Before I ever put this idea out into the world I actually met with someone on my team to ask if they would be willing to manage the Facebook Group for me! We worked on some clear goals and expectations for the group (which we will continue to develop). In my mind managing the group is a 3-4 hour/week job. So, depending on the rate of the person I’m working with I’ll need to pay $60-80ish/week to manage the community. Note: It has the potential to be a MUCH lower cost, but hey, I’m a conservative when it comes to estimating expense. At this point, I know I can outline a marketing plan in 1-2 hours, but then designing could be a 5-6 hour commitment if I do it. Instead, I’m budgeting $400 a month for a designer to take my outline and notes and turn these into the plan. Then, each “breakdown” will need a 30 minute video. So, let’s say I need an hour of my time to create these videos. At this point I have a ROUGH idea of what I want to do, and the key “requirements”. The stuff that’s italicized requires my personal time, the others are listed at estimated outsourcing costs. So, at this point I have content and a community (both key to a membership) outlined at 3-4 hours a month of commitment, and $700 a month commitment. At this point we’ve got content, community, but no access. My easy answer? A monthly 60-90 minute Facebook Live session exclusively for paid members! So now I pull out my cost and value analysis again. Then I personally tack on a 20% buffer, for a safety net. The Golden Question - Worth My Time? “How much do I need to make for it to be worth my time”? But the reality is this is a GREAT and RELEVANT business question to ask yourself. Give yourself permission to be selfish and self-serving for a second. We focused on value for your audience, now let’s focus on the value for you. So for me, to be “worth” my time, I need to generate about $1500/month PROFIT on this endeavor, and personally spend no more than 5-7 hours a month. At $1,500, I won’t feel resentful of how much work it takes and, at 7 hours a month, I can manage without going crazy! So now I do some math. Then I take that and I crunch a few numbers to determine how many students I would need based on my bottom line. There are a million strategies and this is just how I like to do it - if another way fits your fancy, run with that. Based on the numbers AND considering the value of the offer, I settled on a goal of $30 a month. I like how it shakes out, and the number under it ($20 a month) is also doable. You’ll see down the road we won’t LAUNCH with the number we want the membership to end up at. So it's’ important you we picked TWO numbers that we could get down with. I’ve figured out the core “content” of my offer, making sure to hit CONTENT, COMMUNITY, and ACCESS. I determined the COSTS for my offer, both time and financial, to make sure that I felt good about what I was actually committing to. I calculated the potential profits based on a number of prices and settled on two numbers that felt good (for me it was $20 & $30/month). Now, I have everything I need to actually map out and sell this offer to my audience - and that’s exactly what I did next. Before I dive into anything, I like to make sure that my audience actually wants it - which is a lot easier than you may think. If within 24 hours we have people excited, and we get an influx of comments (and requests to join) then we know there’s a desire for it, we just have to package it up to sell. There are other ways we could have validated if we wanted, but for me this was quick, easy, and it cost under $50 to make sure we were good to go (and didn’t take up much time). In this case, I simply recapped what I’ve shared here: what I plan to put in the membership site. There’s a story here - this post is picking up steam and my audience is interested. So at this point, I consider this a valid idea. Depending on your audience size the engagement may be a little bit lower, which is completely fine - but watch for a post that is “more popular” than the average post you put out, and make sure that you get at least 1 or 2 organic shares. Since I know there is interest from my audience at this point, it’s time to launch this baby! Now at this point I know my audience has a desire for this offer, but I don’t know for sure that that desire will translate well to dollars. The only true way to validate an offer is to get people to step up and pay for it. That means the most important step at this phase is to invest my time and money conservatively so I’m not all in on an offer that may not stand up. At this point creating images is the next step, and I’ll be honest, I do have a designer… but I made the images for this promo myself! Instead of having my team work on something that may or may not become a product, I decided to just grab some images from CreativeMarket.com. I’ll use this image (or a slight variation of it) for everything from the checkout page, to the social media images, to my facebook ads. The MONTHLY MARKETING PLAYBOOK is a new membership program I developed to help you achieve real progress in your business without decimating your growing business revenue! >> The Monthly Marketing Playbook: You get a marketing "playbook" that gives you step-by-step instructions to generate more leads and sales with a proven process. Sometimes we'll talk Instagram, or maybe Chatbots, or even Facebook Ads - but it'll ALWAYS be based on real experience and what I've personally done. >> A Monthly Facebook LIVE Q&A: Since the entire membership is housed on Facebook - you'll get to hang out with me on a monthly Q&A call where you can ask ANYTHING! We'll post the date in advance, and you can ask questions whether you're live or not! This will become my “central description” - anytime I want to talk about or pitch the program it’s going to stem from this key description. To sum up what I did, I took each of the three main features and expanded them to talk about the benefit of each feature to my customer to compel them to join. And just like that, I know how I’m going to position my offer to my audience. Just a few simple notes on the Facebook group. The cover photo. I simply used the same photo I posted about and tweaked to fit the dimensions of the group photo. That kept things easy, and it helps start to develop a “brand” for the product. When you start the group you have to add one member, but at this phase you won’t have any new members. I chose to add a member of my team I knew was going to be the community manager if we did have a successful launch. I also included a welcome post (that I pinned to the top of the group) that gave them the go-ahead to start introducing themselves as well as outlined the basic rules of the group. You can go all out on the rules, but for now I kept it short, sweet, and under 50 words. I just emphasized be nice, don’t spam, and all that good stuff. Finally, make sure to add a description to the new group so people know they are in the right place when they first start joining the group. This is something that gets me very excited. For this launch we didn’t have a sales page - we only had a checkout page! Now, I’m going to outline the elements of the checkout page we used, and drop an image of it below. Just a note we used SamCart to build the checkout page and added in some of our own elements. At the top of the check-out page we made sure to include our logo to communicate authority since we don’t have a sales page, and there you’ll see that image we’re using for everything. We made sure to include a description of what they would be getting inside the program right at the top of the page to let them know they are in the right place. Then we added a countdown timer, and a “real time” count of how many spots were left. We decided that we would cap it at our goal to create an additional layer of scarcity, and we only gave people a week to join. So this timer, and member count that we manually updated a few times, gave people an extra push to make their purchase without waiting - because time and seats were running out. In the middle of the page we had a longer description of what was inside the program AND included the benefits this time. Remember we talked about that central description that you can refer back to to fill any space/need during promotion? That’s where we got these benefits from. We also made sure to include a note about our cancellation policy. I felt comfortable with a cancel at anytime policy, but even if you don’t want to go that far, you want to make sure to say something about being able to cancel and/or refund so people feel an added layer of security. There is also a choice on the checkout page for them to pay month-to-month or for a full year. I always like to include both options so I can see what kind of results we’ll get. If you’re curious about 14% of people decided to pay for a full year, which I was completely okay with because my goal was to have more Monthly Recurring Revenue that it was to create an influx of cash. Notice that even though this is just a checkout page we’re including a lot of elements you’d see on a standard sales page. The countdown timer, copy, pricing options all make an appearance - we are doing this on purpose to create an experience that feels fluid. The final section of the checkout page is where we have a few REALLY important elements you don’t want to miss. First, we take PayPal. We’re able to do that with SamCart - and it’s a good thing because nearly 60% of our sales paid with PayPal. Then we have some security badges that let them know they are in a secure place to make a payment. It may seem crazy to think that these little badges make a difference, but they really do. Security online is a big issue, and people in every niche are starting to understand what SSL encryption is, or know to look for security badges as a common practice online. Plus, having PayPal adds another layer of protection to this. Finally, we make sure to include some high level testimonials from my past clients. These are just nice things students have said me or my offers in a “high level” way, but meaning nothing too specific to an offer or program. Whenever I’m collecting testimonials, I always ask permission to use them across multiple offers so then when I get these kinds of testimonials, I can save them for when a new offer gets ready to be tested. Once people purchase the product, I need to get them into the Facebook Group where I’m planning to host all the content! It welcomes them to the membership and lets them know they are officially paid and good to go. It tells them they need to join the Facebook group to finalize their membership. It gives them a simple (and only) call to action to join the Facebook group. One other important note is that we installed the Facebook Pixel from my ads account to this page so that when we run ads (which we’ll talk about in a second) we could track purchases. Additionally, we made sure to link this thank you page to be seen after people purchase - it’s very simple to do with SamCart. You can keep it short and sweet, or write a long form email that has a story. Because people just paid - what they really want is the “how do I access my purchase” information.Keep it direct, and tell them what they want to know! Once people join a new program - even though I haven’t created the program content, I need to have something to give them immediately. You’re all excited to join a new product one of your favorite people or brands is launching. They tell you that you can get in at a great rate if you join early. So you do - and when you get “inside” it’s empty. All that excitement, and now you have to...wait? We want to avoid that! So what I did was simply go to my DropBox and pull out 3 resources that I have used with past students that I knew would be related and relevant to my offer. I uploaded each one to the Facebook group (2 videos, 1 pdf). I created a DOCUMENT in the facebook group that links to the 3 bonuses. My bonus content were things that I knew were short, sweet, and actionable. The goal isn’t to OVERWHELM people with content - it’s simply to show them that they have joined a space with VALUE. In total I had about 60 minutes of video, and one PDF I used as a bonus in another offer. It was easy - keep it that way! Now at this point we’ve got everything set up so that someone can buy the product, join the Facebook group, and be added to my mailing list. Note: Integrating your checkout to your email is a MUST. We want to capture the names and emails of people that join so we can communicate with them in the future. I knew that I wanted to fill all 150 spots ASAP, but I didn’t want to drive my entire list or audience crazy. We’ll talk about Facebook ads in a second, but we followed a simple outline for our emails and messenger. We sent out 3 messages total. Message #1 - Goes to the entire list. Message #2 - Only goes to people that opened email/replied to bot. Message #3 - Only goes to people who clicked. By doing this I only have to send one message to my entire list which helps minimize list burn out, or making my subscribers unhappy. Let’s look FIRST at the Messenger Bots. We use a service called ManyChat that allows use to build a “mailing list” of people through their Facebook Messenger. It’s a very powerful tool for connecting and emailing people right in Facebook. BUT… a quick note about Facebook messenger bot, when you build a list of Facebook contacts, you can’t just send them a link to join (per Facebook’s Terms of Service). Instead, they must click or reply to you, then you may send a link for the next 48 hours. Now that we’ve got the important info out of the way, let’s take a look at the messages we sent. Once they answered “YES!” two things happened. We tagged them as message openers, that way we knew that 22% of people who CLICKED YES should get future messages. We told them a little bit about the program, and asked them if they’d like to join, and THEN sent a link. We did this at 11:40am, and before we could get email #1 out at 12:15pm we had already hit our first dozen members. And for reference, our messenger list was at 1,700 contacts when we started - not massive, but not small either. By the next morning we had sold over half of the 150 seats that we decided to open. We were surprised, but decided to LEAN IN to the excitement that was swirling around and sent a second message via Facebook. This time we didn’t have to write a bunch of prompts to get people engaged because we kept a running list of the people that said “yes” to being interested. So we ended up sending a message to just 214 of the 1,700 people on our list. It told them over half the spots were full to leverage scarcity. It gave them a call to action and a link to click to join. We wanted to reach out to my messenger list of people that said “YES” because we made sure that the first message had a qualifying question. We knew that if they were getting this email they were qualified, so it made sense to invite them again as the seats were filling up. So, to recap this message, we told them to act fast, click a link, and was only sent if they were interested. When we sent out the last message, we only had about 12 seats left in the program. This time we only sent it to people that had clicked over to the SALES PAGE LINK from the messages that we’d sent up to that point. It was a very small, but targeted list. Note: Facebook Messenger/ManyChat can’t track who bought from us, so we also went into this small list and manually removed anyone who’s name had a match on our purchase list. As you can see, it was a very simple message with that same image (slightly modified) and we’re just reiterating that there are only a dozen spots left! This message had nearly 90% of people open it, and one out of every six people clicked it! Not a bad message that lead to some nice sales! I won’t go to in-depth with the emails but for a simple reason. They mirrored the Messenger marketing that we used, but we weren’t limited by the rules or limitations of Facebook Messenger. There is much more flexibility here including how frequently we can send emails, churn rate of subscribers, and ability to send marketing messages. Email #1 Was sent out 1 hour after our Messenger blast. The first email told them about the program, reminded them that there were only going to be 150 spots, and gave them a link to click to go right to the checkout page. Because you don’t have a character limit in email this is your chance to tell a story, create engaging copy, and actually do some of the selling that a sales page normally would. Include those elements and you’re good to go! Email #2 was sent out around 11AM the next day. Before we sent it out we knew that we had already filled about half of the seats in the program. e knew we didn’t need to “hammer home” the value of the program - people were seeing it. So we decided to switch gears and send an email that answered all the FAQs of the program - just like we would if we had a sales page or a formal launch. What will the playbooks be on? When does the first playbook come out? Notice that we’re not just answering questions - we’re talking about WHY they should join, and putting a big bow on it with the steps to go through to join. We’re not just answering FAQs - we’re overcoming objections and closing sales! Email #3 was sent around 9PM that same day. And we mirrored the content of the Facebook Messenger bot. This time no story, nothing fancy, no over-the-top copy. Just a short email that I wrote in 5 mins explaining that all the seats would be selling out tonight so they better act fast. But these messages were not the only driver of sales, we also leveraged 4 distinct Facebook Ads! The ads for our launch came in at just under $120 total, and that includes the interest post that we ran as an ad to our audience. I’ve already described how we ran that ad, so I won’t explain it again, but I will wait for a sec if you want to go back and refresh your memory. Instead telling you again, I’ll use this section to detail the other 4 ads we ran, what we spent, who we targeted, and why we ran them. From years in this space I know that the lowest hanging fruit is people who visit the checkout page but don’t finish their purchase! That means whenever I run a promotion I ALWAYS create this ad. Audience: I ran this to people that as visited the checkout page, but hadn't visited the thank you page that links to the facebook group. Remember early I referenced that it’s important to have these page pixels - now you see why! Spend: In total we spent $10.29 on these ads. Sales: We generated 5 new students, which means we instantly made 10x back on our ad spend (assuming all 5 students paid $20 to start their subscription). Copy/Images: Remember I like to make images that match the checkout page - so I used the same social image I created earlier, but I dropped a few “mock-up PDFs” on the screen to add a more polished and unique vibe to this ad. 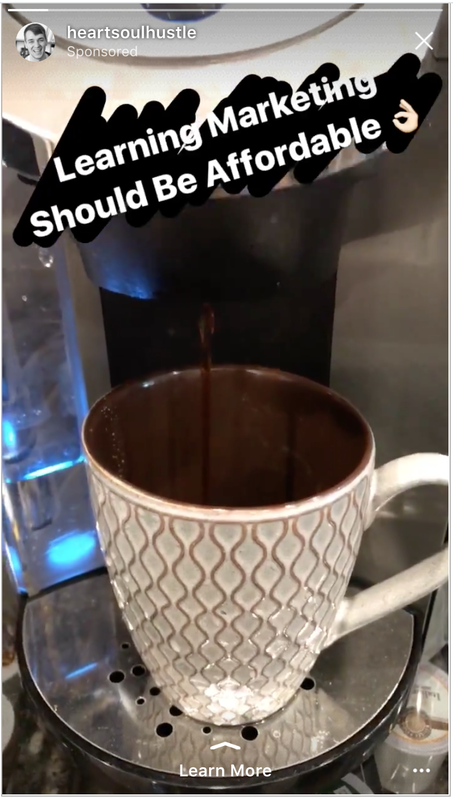 I wanted to find a way to make my entire audience aware of our offer even if they didn’t open up an email - and I knew Instagram Stories could be a great way to do it cost-effectively. Audience: I ran this to my entire warm market as an INSTAGRAM STORY. Spend: In total we spent $31.33 on these ads. Sales: We didn’t generate any sales as a direct result of this ad - but it didn’t lead to a sales page. It was for engagement and exposing people to my new offer. Copy/Images: I kept this very simple! I told them I had something new and exciting they needed to swipe up and see. When they swiped up, I didn’t send them right to a checkout page - instead I linked them to my Facebook Messenger bot and invited them to join there. Why? Because that way, no matter what, I could capture them as a lead and follow up with their engagement with my story. These ads didn’t generate revenue, but they did help us reach a couple thousand people in my audience that may not have seen the email. This was probably one of my favorite ads to run because we posted it to my page and THEN ran it as an ad. We could update the count in real time. People would engage with it and give us more organic reach. We also took advantage of the fact that it was a post to include answers to the FAQs we sent in an email that same day - leveraging the same content in another way and saving time. Audience: I ran this to people that visited the checkout page, but hadn't visited the thank you page that linked to the Facebook group. Spend: In total we spent $4.04 on these ads. Sales: We generated 5 new students, which means we instantly made 20x back on our ad spend (assuming all 5 students paid $20 to start their subscription). Copy/Images: This time we tried a totally different image that I found on creativemarket.com and matched it with the copy from the email around limited spots left, and the FAQs. This ad was essentially just an updated version of our retargeting emphasizing the need to move FAST to save a spot. Our last email and message of the day went out when we had 12 spots left, so we created and updated an ad to reflect that! Sales: We generated 2 new students, which means we instantly made almost 2x back on our ad spend (assuming both students paid $20 to start their subscription). Copy/Images: This time we took the same image from the checkout page, but we decided to run with the “92% full” message - and it worked! This ad was essentially just an updated version of our retargeting that emphasized that we predicted the doors would be closing any minute! Interestingly enough, people thanked us for the ads, the emails, and the messages! In total we spent $115.10 on ads, and brought in 12 sales as a direct result of a click on an ad! A 2x return on total spend, which made us very happy - since we also used over half of that money for exposure to the new product, and the validation post. Note: If you’re trying to find the other $45.02 that we spent, it was on the ad that we used on the validation post from the beginning of this guide. 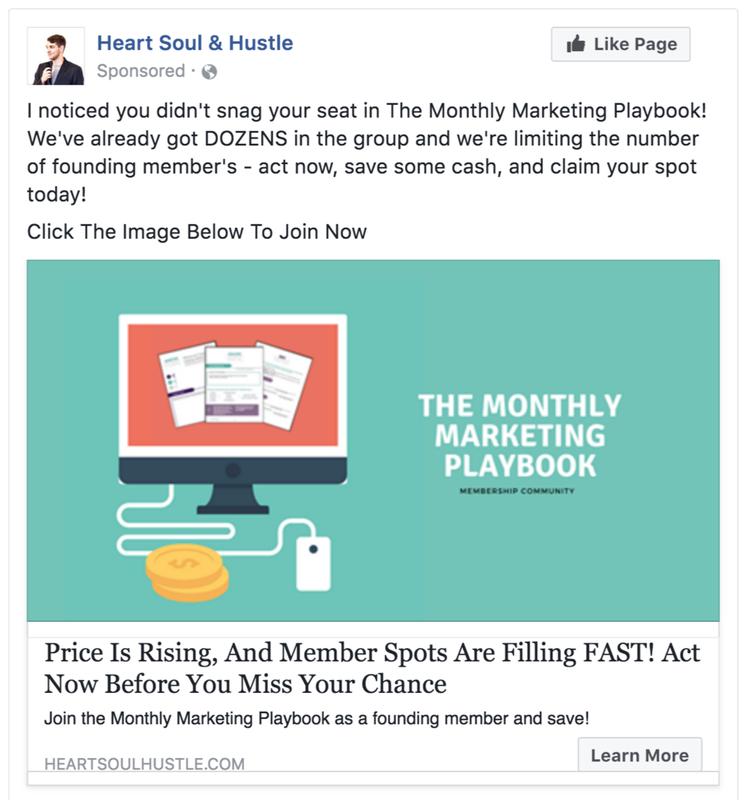 These Facebook ads were not a huge factor (because this wasn’t a big launch), but I can honestly say that the couple hours we put into setting them up was well worth the payoff and feedback we received. It wasn’t all about direct ROI for us because our other goals were building awareness and validating a new product idea - and the ads did an amazing job of that! So we’re down to the NUMBERS AND RESULTS! The most exciting part of any case study is the numbers. 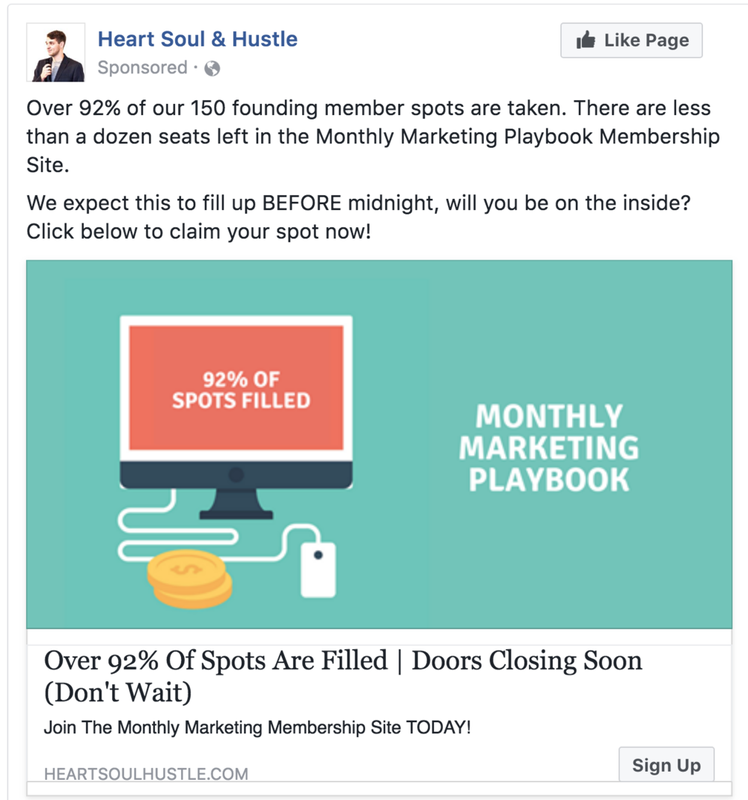 I like to get down to the nitty-gritty and share everything, including clear numbers, so you can see EXACTLY how successful this promotion was. So without all the bells and whistles, here they are! **Note: For the sake of simplicity, these number do not include processing fees from Stripe or PayPal. So if you loved this, what’s next? Click the image below to get on the waitlist for the Monthly Marketing Playbook Membership! We’re closed now, but we’ll be opening up really soon and the only way to know when is to get on the waitlist (oh and as a nice little surprise, we’ll give you a sneak peek of December’s playbook for joining the wait list). And that concludes this epic case study! If you enjoyed it, drop a comment below and let me know! Hearing from people lets me know to create more content like this!